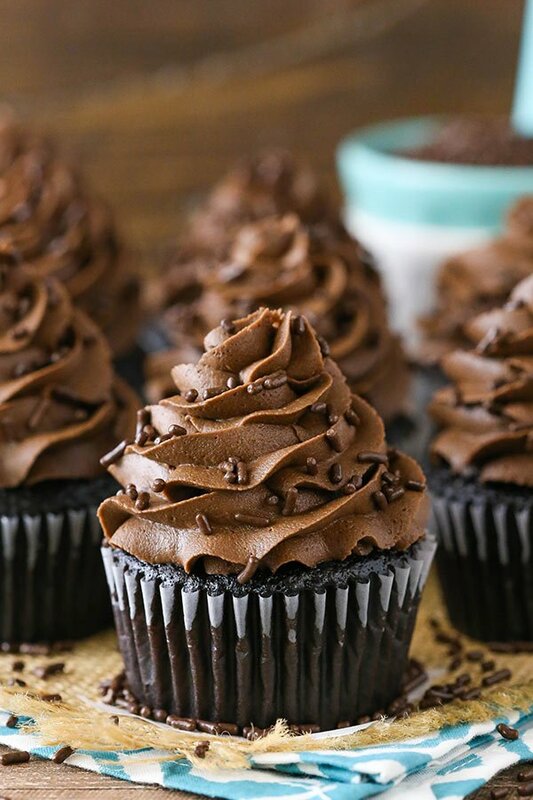 These Moist Chocolate Cupcakes are completely from scratch & full of chocolate flavor! 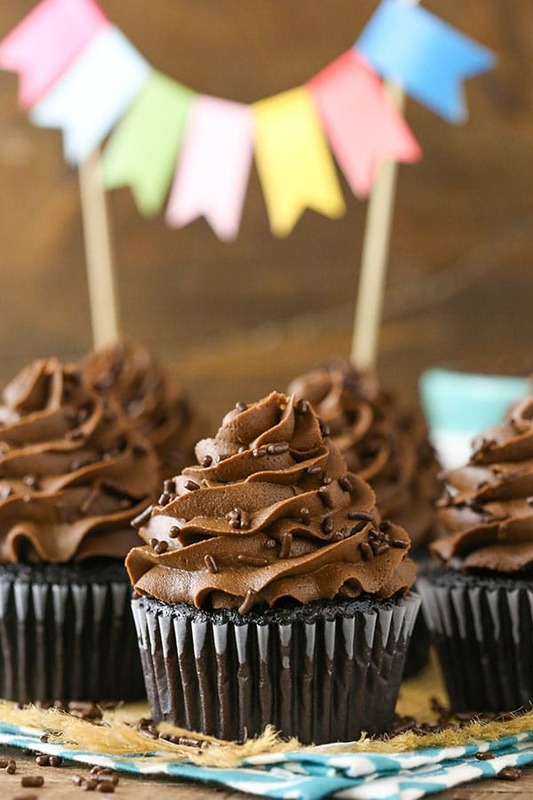 The cupcake is so moist, it melts in your mouth and the frosting is made with real melted chocolate for a silky smooth, super chocolatey frosting you won’t want to stop eating! And then there’s the frosting. The best chocolate cupcakes needed an awesome chocolate frosting. Something silky smooth and full of real chocolate. This frosting begins with butter and melted chocolate. So smooth and delicious on its own. The chocolate gives it a fudgy quality that I love. I used semi sweet chocolate. It’s my favorite to use in recipes like this. It lends a richer chocolate that isn’t bitter. SO good! To make the frosting even more chocolatey and rich, I also added some cocoa powder. I used Hershey’s Special Dark Cocoa blend in both the cupcake and the frosting. I love the rich chocolate flavor it gives, but you could also use regular cocoa and everything would bake up just fine. The final ingredients in the frosting are the powdered sugar and some heavy cream. The powdered sugar will thicken up the frosting a bit so that it pipes well and holds it’s shape and the cream will thin it out a bit. If you need a little help with getting the right frosting consistency, check out my tutorial. 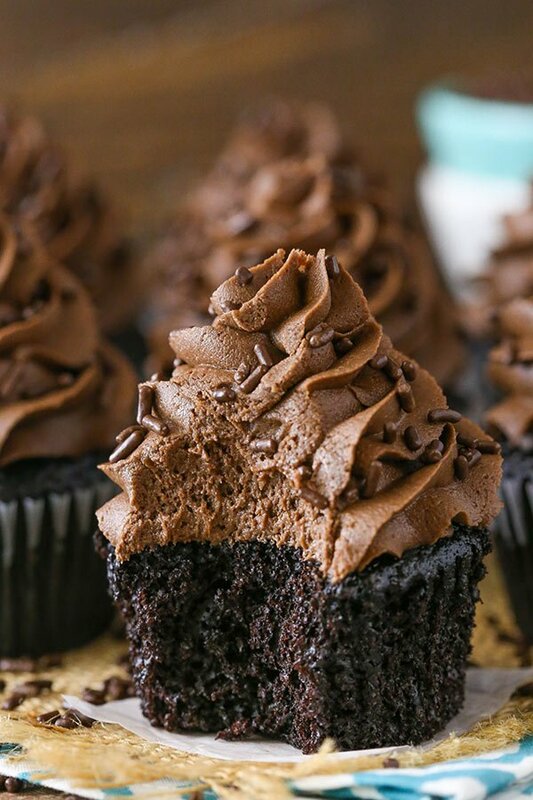 Seriously, these moist chocolate cupcakes are super moist and wonderfully full of chocolate. The fluffy chocolate cupcake with the fudgy chocolate frosting is divine! You’ll hardly be able to take your fingers out of the frosting long enough to put in on the cupcakes but once you do – the cupcakes won’t stand a chance! 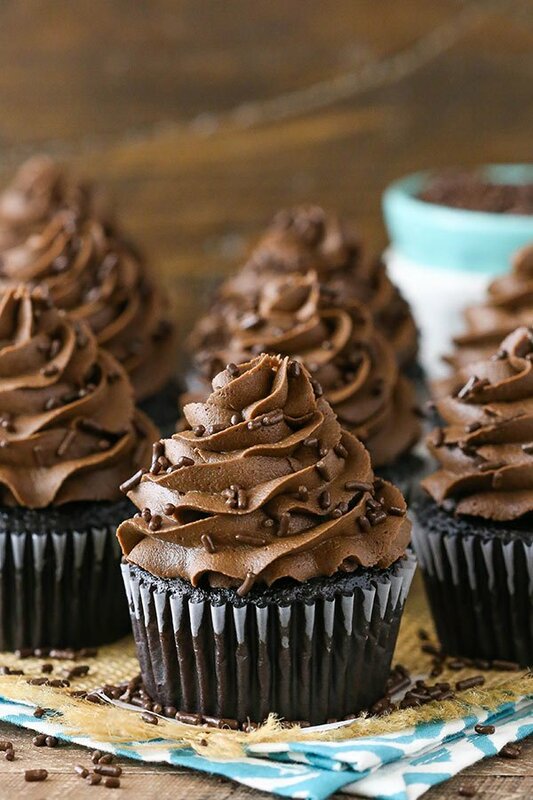 These Moist Chocolate Cupcakes are made completely from scratch! The cupcake is made with oil and is so moist, it melts in your mouth with a fudgy frosting! 1. Preheat oven to 300°F (148°C) and prepare a cupcake pan with liners. 2. Add the dry ingredients to a large bowl and whisk together. Set aside. 5. Add the water to the batter and mix until well combined. Batter will be thin. 6. Fill the cupcake liners about half way and bake for 18-23 minutes, or until a toothpick comes out with a few moist crumbs. 8. To make the frosting, beat the butter in a large mixer bowl and mix until smooth. 9. Add the melted chocolate and mix until well combined. 10. Add the cocoa powder and mix until well combined. 11. Add about half of powdered sugar and 2 tablespoons of heavy cream and mix until well combined. 12. Add remaining powdered sugar and salt and mix until smooth. 13. Add remaining heavy cream as needed to get the right consistency of frosting. This recipe calls for hot water. You don’t have to use hot water – the cake will still bake fine – but the hot water allows the cocoa to “bloom”, which brings out a richer chocolate flavor in the cake. OH MY GOSH THAT PICTURE !! 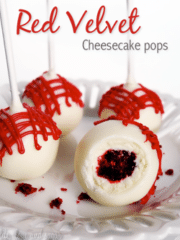 I just can’t wait to make these…… Thank You for sharing !! Thanks Abby! 🙂 I hope you enjoy them! I do believe it would work with these cupcakes. CAN YOU USE AN ORDINARY COCOA POWDER AND NOT FROM HERSHEY???? Yes, another brand should be fine. I’ve noticed you always put water in at the end of all your cake and cupcakes. Does the water make them not as heavy and dense? I’d use the same temperature. Not sure about baking time, but I’d probably start with 8-10 minutes and go up from there. Could you use this recipe in a cake pan? The cupcakes were amazing and I don’t even want to try any other recipe for a cake! Absolutely! You can find a layer cake version of it here. I’m glad you enjoyed the cupcakes! I absolutely love this recipe!! It’s my all-time favorite chocolate cake/cupcake recipe!!! I always hear that it’s the best chocolate cake/cupcake they have ever had whenever I make it. This chocolate frosting looks so delicious!!!! I definitely need to make it!!! Thanks for making me a really good baker now with all your amazing recipes, I know my family would thank you too haha!! Thanks for sharing. 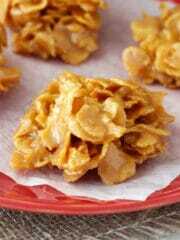 Just tried making them. They r delicious – but I found mine come out the oven all puffy and perfect looking and collapsed two mins later. Any idea why? Also love all ur recipes!!!! Hmmm, did they overflow the cupcake liners a bit? I haven’t have them fall with this recipe, but I’ve had cupcakes fall before when they overflow. yes. it happened to me doing this recipe. can you tell me why? Thank you for this delicious recipe. i made these for a friends birthday yesterday and they were a huge hit. Definitely the best chocolate cupcake and frosting recipe that I have ever made. Do you also have an equally moist vanilla cupcake recipe? My grandson prefers vanilla and I would like to make him some. Hi Lindsay, I made your cupcakes and it was insanely delicious and super moist! Gosh! I could eat a dozen of these cupcakes! Very irresistible! Thank you very much for sharing this. And I have a question. 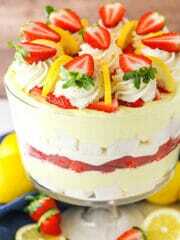 How could u turn the recipe into 2 6×3inches round cake pan? Or 2 8×3inches round cake pan? Please help me. Im dying with your recipe. I’m so glad you enjoyed them! 🙂 You can find the recipe for an 8 inch cake here. Gracias por compartir sus recetas, voy hacer mis primeras Magdalena de chocolate. Hi, thanks for this recipe! I have made these, and realised the cupcakes taste much better the next day! However, they were a little greasy. Comparing this recipe to the moist vanilla cupcake, can I cut the oil here by half? Thanks! This is definitely similar to the vanilla cupcake, but I haven’t tried just reducing the oil by half. If you want a version more like the vanilla cupcakes (as in reduced liquid), I’d suggest this recipe but made as cupcakes with instructions like the vanilla cupcakes. 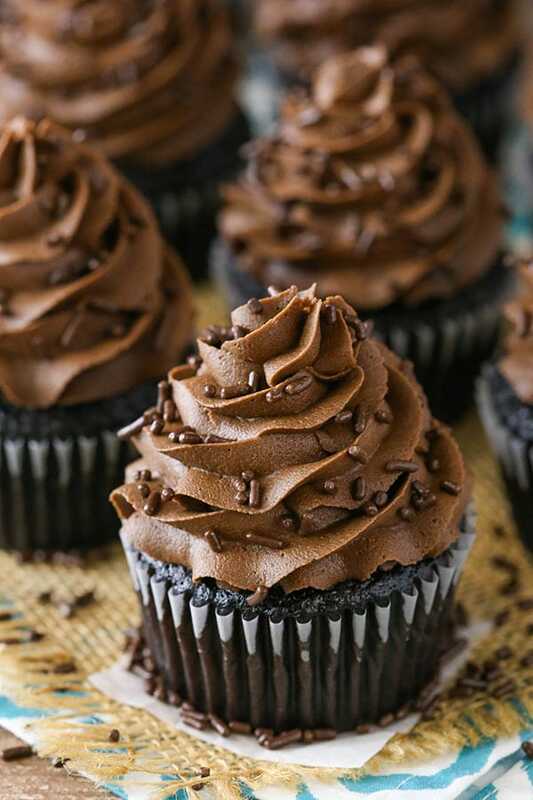 I personally prefer these chocolate cupcakes because I find they are really the moistest ever. 🙂 But both are great options. Hi! Its my sisters birthday this coming January 24. I just want to ask if I can use regular milk instead of buttermilk? Hi. What can I replace buttermilk with? You can use regular milk, if you prefer. You can make buttermilk. If you have sugar milk take 2 tablespoons out per cup and replace with vinegar. Let sit for like 5 minutes don’t stir. Can you make heavy cream from scratch? Can replace hersheys dark cocoa to other brand. ? Yes, you can another brand. Can I use butter instead of oil? Thanks! Can you replace butter milk with milk and get same result? Hi! 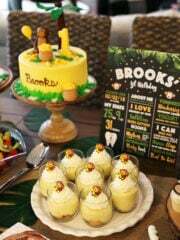 I want to try this recipe for my son’s birthday this weekend, but I haven’t been able to find the Special Dark cocoa powder anywhere. Do you think the regular cocoa powder would work as well? Thanks in advance. Yes, regular cocoa would be fine. Oops can’t edit the comment, but I meant your “Moist* Vanilla Cupcakes” recipe! 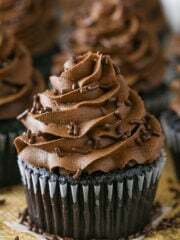 I am making a dozen of these cupcakes and a dozen of your vanilla cupcakes along with your buttercream frosting recipe. Will cutting the cupcake recipes in half change the flavor/consistency of the cupcake? If not, how should I go about using only half an egg in the chocolate cupcake recipe? Also, I am making these for a friends community event that will be held on a Saturday morning/afternoon. I planned to ice the cupcakes on Friday evening, but do you think I should bake the cupcakes on that day as well or should I do them on a Thursday? I just don’t want them to dry out. Cutting it in half should be fine. Not sure about cutting an egg white in half – maybe weight it? I typically make things the day before. These chocolate cupcakes were the best I’ve ever made. They definitely delivered on flavour and were so moist. The icing was also amazing. I doubled the cupcake recipe and it came out beautifully. Thanks for sharing. I made the cupcakes and frosting for my bro-in-law’s birthday. It was a big hit! My sis said it’s the best frosting she ever tasted. I made the mistake of using the wrong tip for the frosting and it looked like the poop emoji lol! HI. 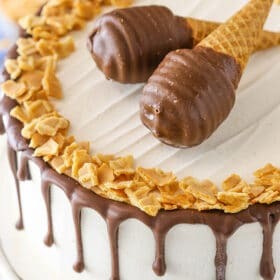 I want to try and make these tonight for my son’s birthday. I was wondering about the frosting. Am I able to reduce the powdered sugar? Or if I cut the recipe in half, how much would it make? We only use very little frosting per cupcake anyway, even though your pics look amazing with it piled high! If you don’t use as much frosting, you should be able to cut the frosting in half. It was easy and yummy but might want to correct the powder sugar from 5 cup to 2 ???? No, the amount if correct. You can reduce it, but it’s correct as written. Glad you enjoyed them. Thank you so much for writing back. Can’t wait to bake another batch and make the icing correctly this time. Love these cupcakes!!! These cupcakes are amazing! They are so moist and soft and have great chocolate flavor! My sister is vegan so I substituted almond milk and vegan egg replacer and they turned out great. They are definitely my new go-to chocolate cupcake recipe! I only had one issue which was that I found there to be a large discrepancy between the amount of cocoa powder used when measured by weight versus volume. This may have just been something I was doing wrong or the type of cocoa powder I used but I went by weight and the chocolate flavor was perfect! I just made these for a wedding yesterday, when I tell you this was the best freaking cupcake I ever had.it was so moist and yes it’s even better the next day. This is my forever recipe for sure. Hi! I love ur recipe! I tried it today for the fans club meeting of my daughter and it was a hit! The members love the taste ! I have a question , how do i store the frosting and the batter left over? And upto how many days can I store the cooked cupcake? Thank u ! I’m glad you enjoyed them! I wouldn’t recommend storing leftover batter that’s been made. The frosting can be kept in the fridge for 2 weeks, or frozen for a month. The finished cupcakes should be best for roughly 3 days. I am going to try new recipes this weekend. So glad to hear you enjoyed them! Thanks Sheila! Hi! Do these need to be refrigerated or left out on the counter? Does the frosting hold up well? The frosting does hold up well. You might want to refrigerate them because of the butter in the frosting, but I’d serve them at room temperature. Yes, you’ll just need to bring it back to room temperature to be able to pipe it. The cupcakes should be good for 3-4 days. I like room temperature, but with the butter in the frosting you might want to refrigerate. Just be sure to serve them at room temperature. If I make cupcakes without the liners, will using Pam be enough? Maybe adding parchment to the bottoms? Hi! These looks great! What size Ice Cream Scoop do you use to fill your cupcake liners? It’s 1 3/4 oz | 52 ml. Tried your cupcakes today and they were very good. I do have a question for you though. I bake a lot, and lately I’ve had this issue where I can taste the baking soda or baking powder in my finished desserts – from cakes to cinnamon rolls. I could taste the baking soda in your recipe as well, & while they were great, I know that’s not supposed to be the primary flavor that I pick up. My siblings said they couldnt taste it, so I know it’s just me; which is frustrating because I want to enjoy the treats too. Is there an alternative for baking soda or can I mix something else in to my cakes to counteract the taste? Try using regular cocoa not Dutch processed. Thanks for this recipe! Everyone loves your cupcake recipe 🙂 I have been making this since june and i got a lot of compliments! Thank you…this recipe is the best! Awesome to hear, Katie! Glad you’ve enjoyed it! I noticed the recipe says 1 cup (130 g) flour and 1 cups (207 g) sugar. Does the recipe call for 1 cup sugar? I want to make sure that I put in the correct amount. Thanks! Yes, flour and sugar weight differently. The amounts listed in grams and cups are correct. 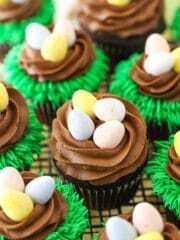 The cupcakes look delicious, therefore I will be baking them thanks so much for being so kind and posting the recipe. My question is can you add coffee or espresso instead of plain hot water? They taste absolutely amazing. They are so so moist. I baked them, they rise in the oven and as I was watchiuand waiting nearing the end of backing they collapse. I dunno why I did everything to point. I saw in comments someone’s collapsed as well? I can’t figure I why. But ate them anyways. They are the best I’ve had. Please let me know if something is wrong. Plus no overflowing at the eim I filled it just as in the video. Now, this is how you teach to make a cake! Detailed information + amazing pictures. This is the recipe for success. Way to go Lindsay! Hi Lindsey, I asked you a question about adding coffee instead of plain hot water, I don’t even see my post. I made these cupcakes and also the vanilla ones too, they were absolutely delicious. I did add coffee to the chocolate cupcakes, they were perfect. I really hope that you don’t mind that I did that. The cupcakes lasted for almost a week, ( I made a lot of them ), stayed fresh and moist. The icing recipe is definitely a keeper, it will be my go to from now on so thank you very much for your great recipes. Next the white chocolate raspberry mousse cake, then the banana, etc. Hi, I’ve just made these cupcakes and definitely next time using self raising flour as all purpose plain flour gave me no rise at all. Absolutely the best homemade cupcakes I’ve ever baked or eaten! ???? Just tried these. l ended up adding a bit more flour to my second batch. The first batch is so squishy and the top is full of holes. Second batch already looks a ton better. Best recipe ever. Tried many ones this one in the one. 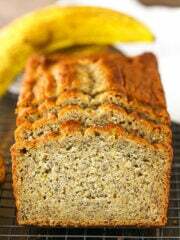 Can I replace the All purpose flour with Whole wheat flour for this recipe? Please let me know. Also, can I let go of egg.. if not, can you suggest a substitute to egg. I made these for a girl’s night in and they were a huge hit. But the final say goes to my son the chocolate expert who says they are the best ever!! High praise. Followed your directions no changes ( although I used regular dark cocoa as I dislike Hershey’s) these are very moist and delicious and not too sweet. The butter cream icing is good too. I only frosted half the cup cakes and refrigerated the remaining frosting. Next day I let it come to room temp, beat it with a hand mixer with a few tablespoons of cream and it was awesome, pipes well too. I find many cupcake recipes are too dry but not these. These don’t rise super high but I prefer the flat top for decorating, It reminds me of an old timey cake recipe my great aunt made using the baking soda and adding the hot water at the end! Can i use regular cocoa powder? My family isn’t a big fan of dark chocolate? Whenever a cake/cupcake recipe calls for hot water, I always use coffee instead. It will intensify the chocolate flavor without giving it a coffee flavor. Don’t waste the opportunity to add more flavor. I have a similar recipe for this and using the coffee made it so delicious and so moist. is it really baking soda not baking powder? After years of baking, I have never found a chocolate cupcake recipe I felt was just right. My favourite chocolate cake recipe is great but just doesn’t translate well to cupcakes (no idea why!) after some googling today, I came across your recipe and I think I’ve finally found my go to recipe! Chocolatey enough without being too heavy, so these can handle the frosting without being too rich. This is my first time to try a recipe of yours and the cupckaes came out really good! Very moist, fluffy and chocolatey! I also tried your vanilla cupcake recipe and they came out great as well! I have a problem though. I am baking in a convection oven and my cupcakes always come out with dome tops. How can i avoid that? Thank you! I don’t use a convection oven, so I can’t say for sure. It’s possible baking on a slightly lower temperature would help. Hi, Can i use Hershey’s 100% Natural unsweetened Cocoa powder? or will it not be sweet enough ? Can i use Hersey’s Natural 100% unsweetened dark Cocoa powder ? or will this not be sweet enough? Hi! I LOVE this recipe, every time I make them people rave about the cupcakes. 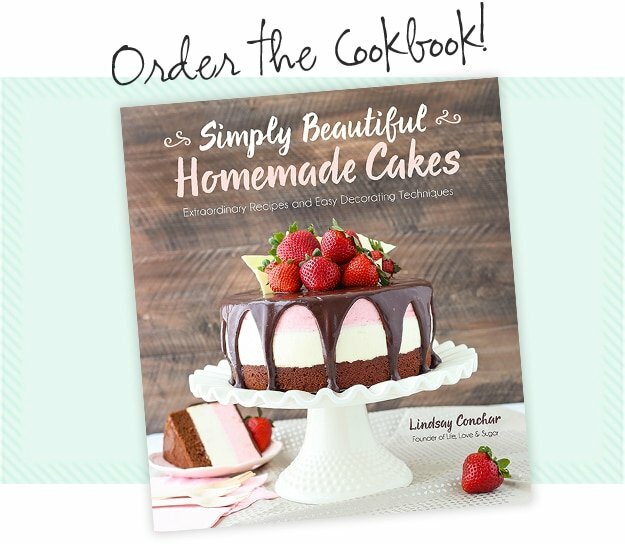 I wanted to ask if I could use this recipe for doing cakes? Is it specific to just cupcakes? How long would I bake if doing a cake? Or will it be too moist to hold up for a 2 tiered cake? Thank you so much, love this recipe. You can find a similar cupcake in vanilla here. Glad you’ve enjoyed them! Hi I wanted to make chocolate cupcake for a friend and decided to follow your recipe. I just want to ask if this recipe can make 12 cupcakes? How could I use this recipe for a 9×13 cake? You would want to double the recipe and adjust the baking time. I’m not really sure what the time would be, but because it bakes at a low temperature, it’d be a bit. There’s also this recipe you could try. Your cupcakes looks amazing! I’m going to try baking tomorrow for a party. Could i check if i could add kahlua liquer instead of vanilla extract to the cupcake batter? That wouldn’t really be enough Kahlua to taste it. I would suggest trying this recipe and turning it into cupcakes. Is there a way to not use buttermilk? Should I just replace it with regular milk? Yes, you can just use regular milk as well. Yes … add a tablespoon of white vinegar to the milk and let it sit for 5 minutes. Now you have buttermilk! Hi it is possible to keep it moist 7 days at fridge? I planning to display at coffee shop? Seven days could be a little much, but you could try it. I’d say 3-4 days is safe, 5 should be ok.
Are there any supplements for buttermilk? You can also use regular milk. I use 2%. I only have unsweetened cocoa. Will it not work for this recipie? Should I add more sugar if I use it? If so how much? Yes, regular unsweetened cocoa is fine. No other adjustments are needed. Is there any way to not use the heavy wipping cream? You could use milk or water instead. It’s primarily there to help thin out the frosting. Could I use unsweetened cocoa? Hi Lindsay, Can i use dutch-processed cocoa? What difference will it make? Thank you. Hi Lindsay. Can i use dutch-processed cocoa? Will it make any difference to the taste/outcome? Thank you. can you use coffee instead of water, just for chocolate flavor to pop!? I haven’t tried dutch process cocoa with this recipe, but I imagine you might need to adjust a bit. One thing I wanted to mention – has anyone put leftover frosting in the freezer to use later? I did this and was unable to return the frosting to its original consistency. It was just a hardened lump after thawing, which I guess makes sense due to the melted chocolate chips in it. If you put this frosting in the refrigerator (either on the cupcakes already or in a bowl) what happens? I absolutely LOVE your site!!! I made these cupcakes today and they are literally the lightest yummiest I have ever had. I really hate chocolate but these are good!!! I also made your vanilla ones and boy were they top notch! So many compliments!!! I didn’t make the frosting in this recipe because I decided to go with an Italian Buttercream instead. You absolutely must give these a try, they are so moist!!! Thank you so much! I’m so glad to hear you enjoyed both of them! Thanks Tina! These were awesome!!! Thanks for a great recipe!! Hmmm, I don’t usually have that issue. Have you tried different liners? I usually just use the ones from the grocery store, which I believe are Betty Crocker. Made them with milk instead of buttermilk, they were awesome!!!! thank you!!! can i use milk instead of buttermilk?? My frostin seemed to have quite a few air pockets and would not frost smoothly. any tips? Air is usually incorporated when it’s beaten on high speeds or for long periods of time. It’s hard to remove air once it’s there, but in the future, consider using a lower speed when mixing. Hey, can we use normal cream for the frosting rather than whipped cream and any milk chocolate? My cupcakes didn’t rise as much. What am I doing wrong? Also is baking soda and baking powder the same thing? P.s such great work you have ???? One more thing. Can I make the batter and store it to use later? No, you’ll want to use the batter as soon as you make it. Milk or other cream should be fine. I’d suggest a good quality chocolate chip or baking chocolate bar. As for the rise, it’s hard for me to say, but baking soda and baking powder are not the same so if you swapped that around, then that could definitely be the reason. I’ve been looking at the difference between your chocolate and vanilla recipes and I was wondering, would I be able to just leave out the cocoa powder in order to make vanilla cupcakes in this specific recipe? I don’t believe that would work. If I remember correctly, I tried that once and it didn’t. Just made this today ????. Oh my! This is my new fav recipe of choc cupcake. It is indeed moist and soft and light! Loved it. I’m still new at baking so I wanted to know if it’s okay to add milk and melted butter instead of buttermilk.Is it still the same thing? No, it’s not the same thing. You can use regular milk instead of buttermilk, or you can use make your own buttermilk with some milk and vinegar. 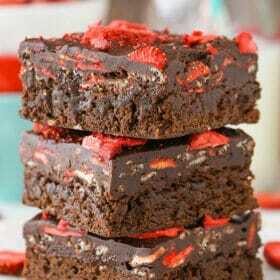 Going to make these tomorrow. I love your recipes and have made several if then.I think about baking all the time now! I wish I could quit me job and be a baker! I hope you enjoy them! So glad to hear you’ve loved the recipes! How can i adjust this recipe if I use 6inches round cake pan in 3 layers? Please help me. I’m not really sure. I don’t ever make 6 inch cakes. I’m sorry! I haven’t tried it but that should be fine. I just made these cupcakes and they are delicious. I haven’t frosted them yet though, because the frosting is way to runny to use. It’s similar to a glaze. It looks like your frosting in your video in the beginning, before it lightened in colour and formed up. So now I don’t know what to do! I added more powdered sugar but that didn’t help. Hmm, that seems strange. Did you double check the amounts of ingredients? Sounds like either too much or too little of something was added. i really love your recipe. Thanks for sharing! Hmm, the moist vanilla cupcakes would be the vanilla version of these, as they are quite similar with the exception of the cocoa. You’d have to make other adjustments to this recipe for it to work as a vanilla cupcake and you basically end up with the moist vanilla ones. If you aren’t happy with those, these are also great cupcakes and this cake works as a great cupcake. The best chocolate cupcake recipe ever! So glad to hear it! Thanks Tanya! My mom and I made cupcakes for the first time ever (we are european) using your recipe and she wanted to thank you as they came out excellent. They are so sooooo good! Everything turned out great, but we did have to cut down half of the sugar for the frosting. I just made these as a trial for cupcakes for my son’s birthday party. They turned out amazing! I was wondering if I could triple the recipe or should I make them in three batches? So glad you enjoyed them! Tripling the recipe should be fine. Oh my goodness! I just made the cupcakes and they are amazing! I haven’t even made the icing yet! The cake is, by far, the best cake recipe I’ve ever used. It will be my “go to” recipe for any and all chocolate cake requests. I’m so glad I found your blog! I’m so glad to hear that! Thanks Karol! hi, may i know why my cupcakes very dense? However, instead of using baking soda, I replace it with 3 tsp of baking powder instead. For some reason, it taste differently when I use baking – like there’s an after taste to it. But overall, this recipe is perfect. SO GOOD!!!!!! I love this recipe!!! 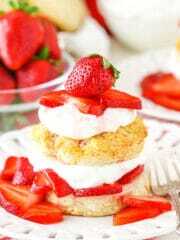 So most and delicious!!!! I was wondering if I could just make one batch of the batter and make a cake out of that??? Thank you so much!!!! ???? So glad you enjoyed them! You can make a cake – I actually have that Chocolate Cake recipe here. made these and they turned out so good only thing was that my frosting was still abit grainy 🙁 like you could still feel the powdered sugar not sure how to fix it for next time? My guess is that you need to sift your powdered sugar. Hiya, I have every ingredient for these except for cocoa powder, however I do have chocolate chips. Would I just use the same measurement of melted chips as cocoa powder? I would honestly have to test that out to see if that swap would even work. This is my latest cupcake attempt as i work my way through your sweets! So far, i’ve tried the Moist Vanilla, Boston Cream, Pumpkin Chocolate Chip, and now this one. Each and every time, i think the latest one is the best, and this one is no different. It is super moist, tender, and amazingly rich without being overpowering. it is definitely dark–but perfectly so. I love it and will add it to my permanent cook-book, just as i did the other three! Cant wait for what’s next! I think it’s gong to be the Pina Colada one! I made these cupcakes today… the only difference is that I halved the water 60ml with water and 60ml with espresso to bring out the chocolate flavor and I can tell you this was amazing….these cupcakes were moist and scrumptious… I didn’t get the HERSHEY’s so I had no choice to use local baking cocoa powder but it came out amazing… the Wilton liners were a bit oily but I don’t know if it’s the recipe or the quality of the Wilton… Thank you for this recipe you delivered as promise delicious and moist… Can’t wait to try other recipes…. This was the best chocolate cupcake recipe I have ever had in my life, and I use to work at a cupcake shop that supposedly had the best. This was just so moist and delicious! The only thing I changed was the hot water for coffee and other than that I kept it the same recipe. Seriously take it from me, this is the best recipe hands down right here. Thank you so much for sharing this recipe and I am going to share this recipe with my family and friends if that is okay with you. Great recipe! i made it yesterday and it turns out to be my favourite one 🙂 Thank you very much for sharing it ! Wonderful! I’m so glad to hear that! Not the best recipe. Flour/sugar measurements don’t make sense. Batter is runny. Doesn’t make standard 24 so was annoying when I had to make more to get 24. Cupcakes overflowed all over and I was sure not to overfill. Now I just have a mess and have to start all over. Won’t be making these again. What about the measurements doesn’t make sense? They are each one cup. Is there something that’s unclear? And yes, the batter is runny – it’s supposed to be. If they overflowed, it’s because they were overfull, despite being careful about it. These really are great cupcakes when baked correctly. I’ve made this multiple times, and it really is an amazing recipe. 16 perfect, delicious cupcakes every time. But quick question: Do you ever use buttermilk substitutes in your baking? (e.g. adding vinegar or lemon juice to milk; using yogurt or sour cream). And if so, do you have a preference for a particular method? I just don’t have any other buttermilk recipes in my regular arsenal, and pouring out most of an unused container of buttermilk every few weeks is bumming me out. I’m so glad you enjoy the recipe! I actually do – I use powdered buttermilk. I hope that helps! Just a follow up to say that I’ve tried out yogurt now a few times and it works beautifully. Also, not necessary, but using hot coffee instead of hot water just helps boost the chocolate flavor even further. I personally like to have some fun with a hazelnut coffee to add a little bit of a nutty taste when I make this into a bundt. Thanks again for this family favorite! can you leave the frosting out ? Or does it need to be refrigerated? It should probably be refrigerated since it’s all butter. 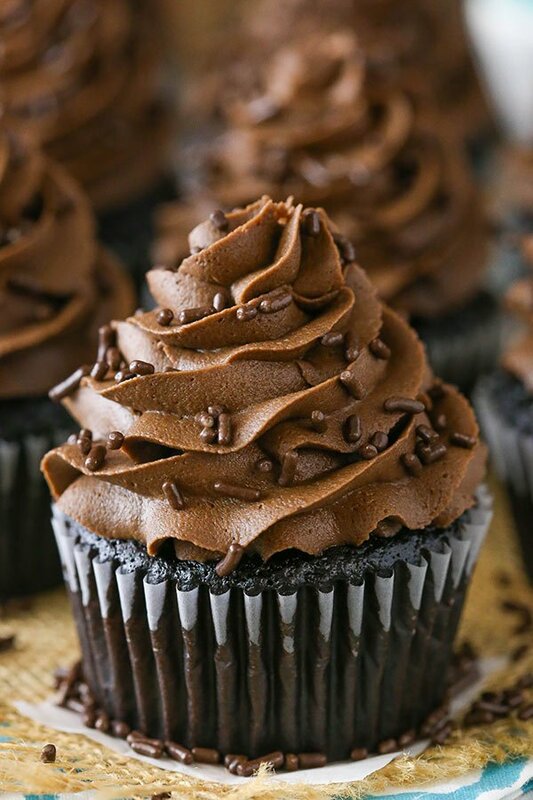 This is my favorite chocolate cupcake recipe of all time!!! Absolutely delicious. Thank you! Wonderful to hear! Thanks Morgan! Your cupcakes looks really good,can’t wait to try them out. But can I replace buttermilk with normal milk? Hello! I am so thankful that you made this recipe , I just took them out the oven and they are cooling down. I own my own cupcake business and it’s called Infused Cakes. I’m getting it back up to where it was. I have been struggling for years trying to find the perfect chocolate cupcake recipe, all of the other ones just came out very dense and heavy. These are absolutely perfect. I can’t wait to frost and eat them! You should be able to do an even swap for cake flour. Can this recipe be used for a chocolate layer cake? Yes, you can actually find it here. Simply the best moist, fluffy chocolate cupcakes I have ever tasted! I have tried many and this recipe is sure a keeper. 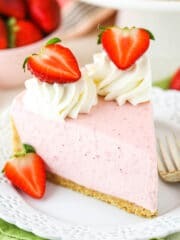 I don’t even need frosting to compliment this as it’s already a very yummy cake but I am sure with frosting it would be even more delicious, Would make a lovely dessert for any occasions, thank you so much for sharing this wonderful recipe. 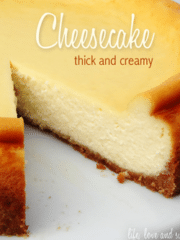 Easy with minimal ingredients too. I don’t have buttermilk and subsituted with making my own, 2 teaspoon of apple vider cider to 1 cup of milk and let stand for a few mins. I even used a cupcake maker to make this and they came out beatifully, just keep popping each cake into my mouth! Awesome!! So glad you enjoyed them! Thanks Tiffany!